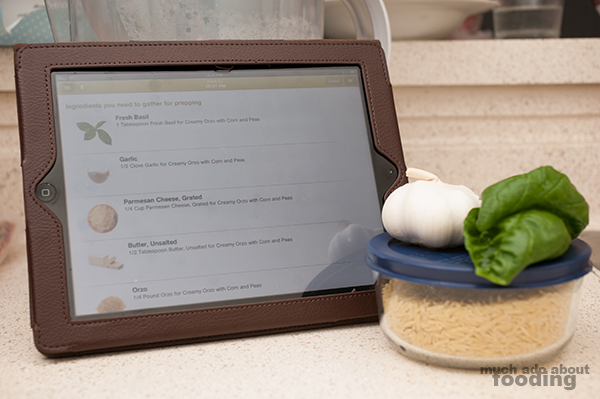 Today's recipe is from the Cooking Planit app. I'll be participating in a T-fal cookware giveaway (look for information on the 19th!) coming up and wanted to show you all a recipe that they have available for the everyday cook. When I made it, I actually did half the recipe portion due to ingredients on hand but the recipe below is for four servings. It's listed as taking 40 minutes to make at 6 minutes prep and 34 minutes cook time. We both liked it a lot since it was simple yet flavorful. The steps below will be written as they are in the app (available on iOS) though I have combined a lot of them. They do it one line at a time. "Pick basil leaves off the stems. Pile leaves on top of each other and slice crosswise into thin ribbons to measure the indicated amount. 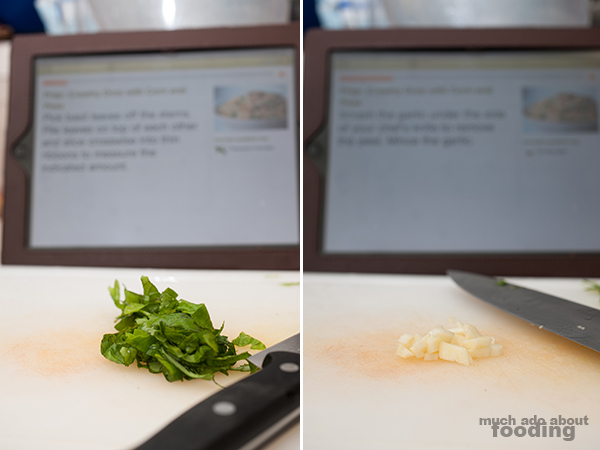 Smash the garlic under the side of your chef's knife to remove the peel. Mince the garlic. 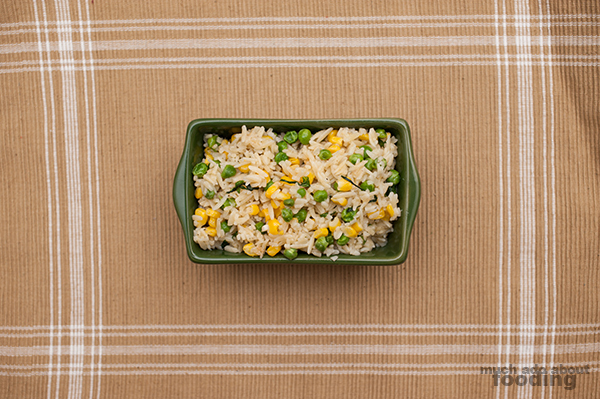 Measure out the frozen peas and corn into a medium microwave-safe bowl." "Fill a medium saucepan 2/3 high with water and cover. Place over high heat. Proceed with next step as water comes to a boil. 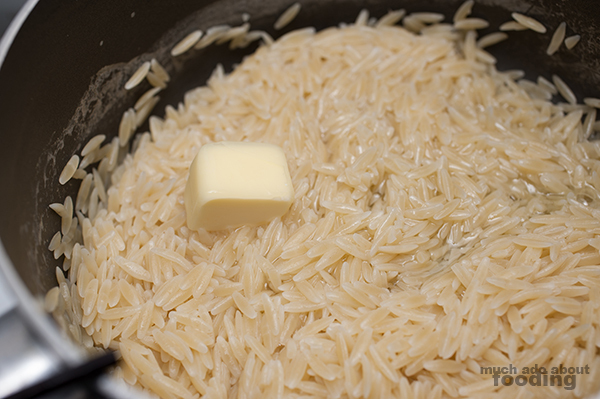 Once water is boiling, add 1 tablespoon of salt and stir in the orzo. Cook until tender but with a slight bite, about 9-10 minutes or according to the package instructions. 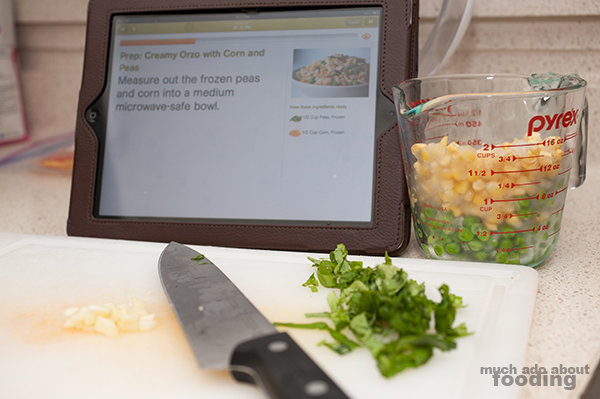 Place the peas and corn in the microwave and heat on high for 2-4 minutes until mostly defrosted. Once you've strained the orzo, place the empty pot back over medium heat. Add olive oil and butter. Once the butter is melted and oil is warm, add the garlic. Saute for a quick minute to soften then add corn and peas. Saute until they start to caramelize." "Once peas and corn have started to caramelize, add the orzo to the pot and stir in the basil, grated Parmesan cheese and remaining butter. Season with salt and pepper to taste. Remove from the heat once the butter is melted. 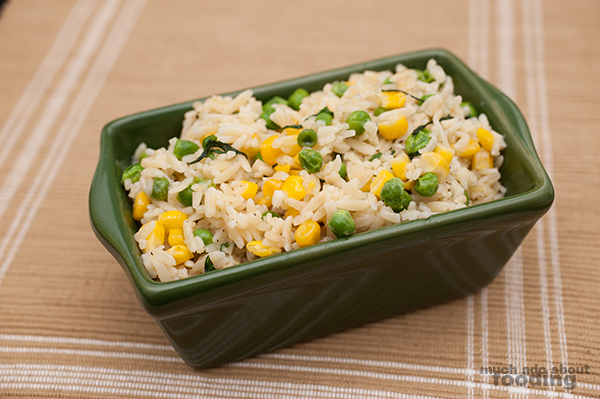 Transfer the creamy orzo with corn and peas to a serving dish or dinner plates and serve warm!" Photography by Duc Duong as Minerva was trying to read and cook at the same time. Looks delicious! We will have to give this a try one night this week.